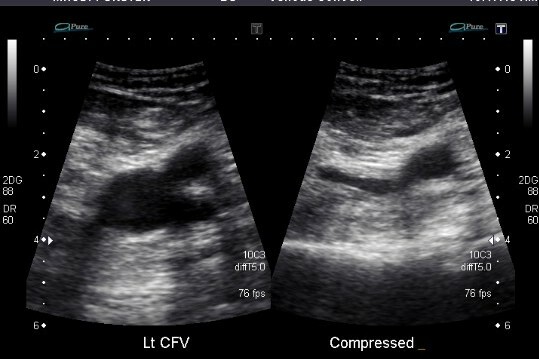 EUS for DVT is a real-time compression evaluation focusing on the lengths of the common femoral (CFV) and popliteal veins (PV). It is important to take a systematic approach. Starting at the inguinal ligament, apply pressure every 1-2 centimeters as you travel distally. Check for compressibility all the way until you are a few centimeters beyond the CFV branching point. Place probe above popliteal crease. Check for compressibility every 1-2 centimeters as you move distally 7cm beyond the crease. Femoral: Supine with head of bed slightly elevated or in reverse Trendelenberg positioning. Patient’s leg should be slightly bent at knee and externally rotated. Does this patient with lower extremity swelling have a DVT? Positive: Incomplete compression of a deep vein at any site. Negative: Complete compression seen at all three sites. If clinical suspicion is moderate to high, order a repeat scan in 5-7 days to rule out progression of calf vein thrombosis. If the artery exhibits compression before the vein, that is a positive finding. Use Reverse Trendelenberg positioning for difficult to see veins. Tether the probe to the patient with one hand, and apply perpendicular compression with the other. When doing the femoral exam, fully expose the patient's leg from the inguinal crease to the knee. This includes lifting back abdominal pannus to insure that you are starting at the inguinal crease. If moderate to high risk, order a repeat study 5-7 days as segmental calf vein thromboses can propagate to become clinically significant DVTs. 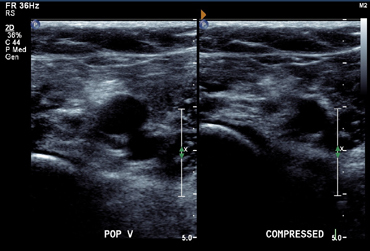 Be careful not to confuse Inguinal lymphadenopathy for a non-compressible common femoral vein. A longitudinal view may be necessary to confirm that it is in fact a vein. 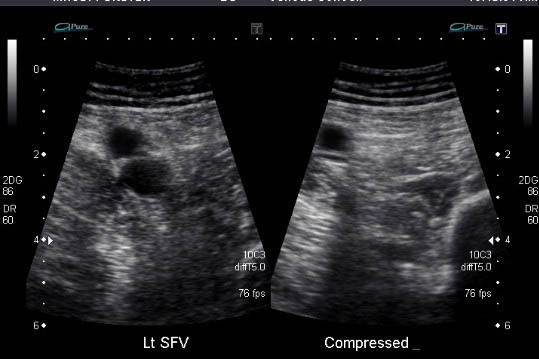 Augmentation Technique: Place color flow doppler over the vein in question. Squeeze the calf and look for good color flow through the vein. If there is a filling defect or no flow at all, it’s an indication that there is a clot obstructing flow. Assess Phasic Flow: Use phasic flow to evaluate for possible occlusion proximal to the Common Femoral Vein. Place the probe at the level of the CFV and check for phasic flow that corresponds to the patient’s respirations.